A Guildford town house, a young family, a mature beech tree and a dangerously steep front access. A combination requiring careful planning, and a substantial engineering solution. 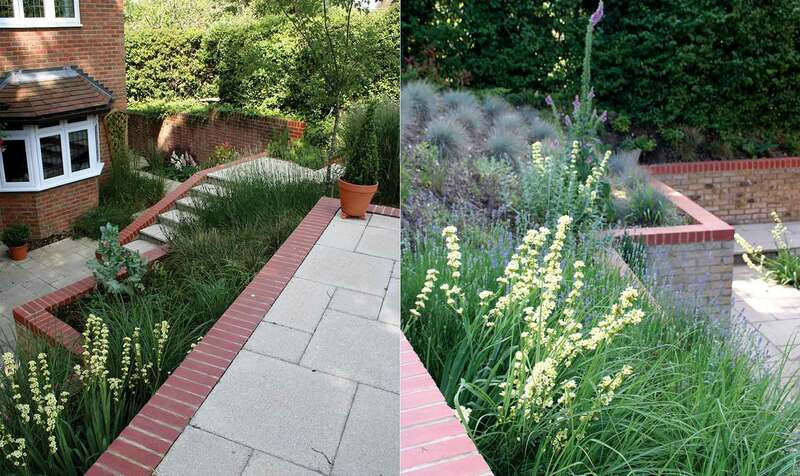 The landscape architects, Designscape UK, were commissioned to design a functional layout that enhanced the property's visual aspect but also resolved the access problems to the front entrance. Their concept design was developed by LDC Gardens and the engineers to provide a final cost for the client and a set of details for the construction stage. The safety of the client was a fundamental consideration, so before excavations could commence a temporary access ramp was installed from the front drive to the rear garden patio and the work area was secured. To enable foundations construction, the front bank was excavated to a depth of 5 metres. Excavation around the mature beech tree at the top of the bank was minimised and all excavations were carried out by hand. In total over 90m3 of spoil was removed from the site. The major part of the project involved the construction of a series of reinforced concrete rafts and retaining walls (maximum height 4m). This formed the foundation for the new terraces and steps. The retaining walls were finally faced and capped with brickwork to match the style of the house. The terraces and steps were constructed from non-slip paving slabs. Unfortunately the foundations formed the highest cost of the project, and to the clients' dismay were buried underground! This project was dictated by the unstable ground conditions and the level changes. Sound structural engineering ensures that the scheme will be a permanent, safe structure. 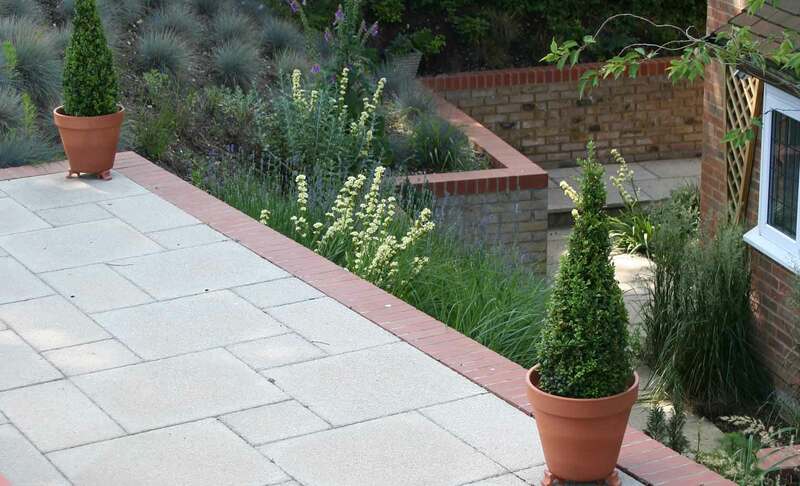 The clients have undertaken their own planting scheme as an ongoing project.